There are seven cervical vertebrae in the neck that support your head and connect it to the shoulders and body. A fracture (break or crack) in one of the cervical vertebrae is called a cervical fracture or sometimes, a broken neck. Cervical fractures are most often caused by a forceful impact, or traumatic blow to the head. Athletes involved in impact sports, or participating in sports that have a risk of falling of 'snapping' the neck (skiing, diving, football, cycling) all are linked to neck fractures. Any injury to the head or neck should be evaluated for a neck fracture. A cervical fracture is a medical emergency that requires immediate treatment. 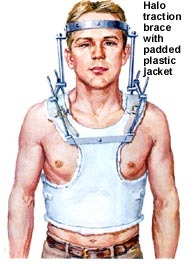 Spine-related trauma may injury the spinal cord and could result in paralysis, so keeping the neck still is critical. If there is any chance of a cervical fracture, the patient's neck should be immobilized (not moved) until medical attention arrives and X-rays can be taken. It's best to assume there is a neck injury in anyone who has an impact,fall or collision-type of injury. Symptoms of a cervical fracture include severe neck and head pain, pain that radiates [travels] to the shoulders or arms, or bruising and swelling at the back of the neck. The treatment of a cervical fracture depends upon which cervical vertebrae was damaged and the extend of the fracture. A minor (compression) fracture is often treated with a cervical collar or brace worn for six to eight weeks until the bone heals on its own.